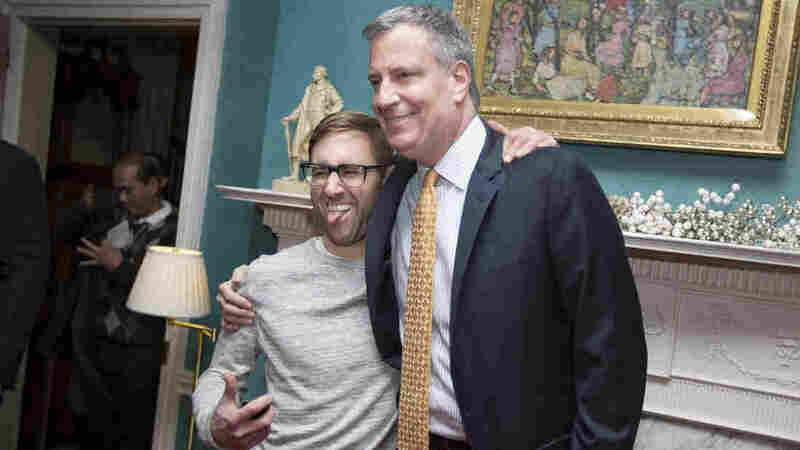 Letter From Gracie Mansion: The New Mayor Meets His City : It's All Politics When newly inaugurated Mayor Bill de Blasio opened the doors of the beautiful 1804 mayoral mansion to the public, New Yorkers showed up in force. And de Blasio spent five hours trying to make them feel welcome. New York Mayor Bill de Blasio poses for pictures with visitors at Gracie Mansion, the official residence of the mayor, during an open house and photo opportunity with the public as part of the inauguration ceremonies on Sunday. I've always wondered what it would have been like to be at the White House in 1829 when President Andrew Jackson was inaugurated. He threw open the White House to the public and some 20,000 people stomped through, apparently causing a rowdy mob scene. So I was intrigued with the fact that New York's new progressive mayor, Bill de Blasio, planned to open Gracie Mansion to the public this past Sunday. He kept calling the official mayoral residence, "The People's House." I decided to go. Almost two weeks before, on the night before Christmas Eve, I had entered Gracie Mansion for only the second or third time in my life. It's a beautiful, Federal-style, 1804 mansion that has been the home to New York City mayors, although Mayor Michael Bloomberg never lived there during his 12 years in office, preferring his own townhouse. De Blasio hasn't moved in yet and has mixed feelings about leaving his beloved Brooklyn. The occasion on that December evening was Bloomberg's farewell to the New York press corps. The wine flowed, the hors d'oeuvres were spectacular: sushi grade tuna and shrimp and all kinds of lovely delicacies. The blue walls of the mansion's ballroom radiated with the light of its chandeliers. It was a lovely event, crowded, but not too crowded, as the mayor said his goodbyes to the media. 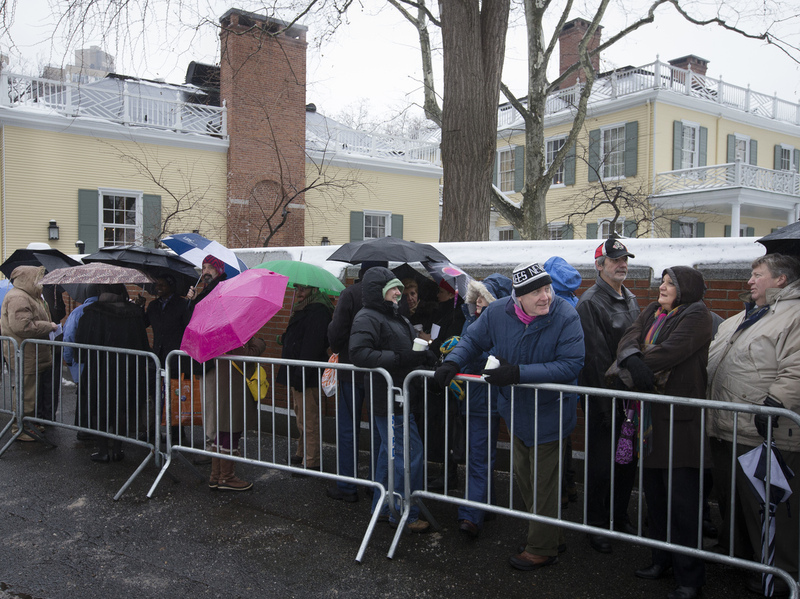 Visitors wait in the cold outside Gracie Mansion as newly elected New York Mayor Bill de Blasio, not pictured, holds an open house and photo opportunity with the public on Jan. 5. So on Sunday, I wandered down to Gracie Mansion to see how different it would feel when it was opened to the public under a new administration. Shades of Andrew Jackson it was not. The event was very organized. Some got tickets by lottery, some because they were volunteers or donors, some because they got on a website within the first 90 minutes of availability. If the event wasn't open to everyone, it was open to several thousand — and a line of people stood in the freezing rain to get in. The line, several blocks in length, forced some people to wait two hours. Members of the media were in such abundance that even they had to wait at least 30 minutes to get inside. Ordinary citizens got free hot chocolate and hot apple cider. Groups of musicians moved up and down the line. Inside the mansion, people slowly moved through the ballroom in lines not so different from those at Disney World, but people could look around while they waited, at the Christmas tree, the fireplace, the chandeliers. It seemed like a long ordeal just to have a minute with the new mayor, but everyone seemed relaxed. It was a five-hour marathon for the mayor. He stood with each person, group or family, hugged, shook hands and said a few words. Everyone got to have a professional picture taken with the mayor. I walked up to one guy, Jacob Wicks, who was standing just a few feet from the hallway leading to the mayor. He had done some volunteering and received an e-mail. He said he responded to the e-mail within five minutes and got tickets for himself and a friend. He told me he'd never met the mayor and he'd never been inside Gracie Mansion. He was excited. And that was pretty typical of the responses. How different did the two events feel? Not as different as I thought they would. Sunday's open house was more inclusive, but still pretty controlled, despite the music, the apple cider and the hot chocolate. You just didn't walk in. It was no Andrew Jackson mob scene but, then, that's probably just as well. If nothing else, the mayor proved himself a born politician, like he could do it for hours.